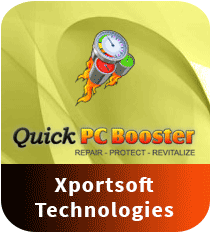 Quick PC Booster is robust product by Xportsoft Technologies that works wonders on Windows computers. Its potential to speed up slow Windows PCs and laptops is unparalleled by any other software in the similar niche. This amazing Windows product is extremely powerful and efficient when it comes to clean up all bothersome issues that your computer is struggling with and which are not letting you experience a seamless computing on your Windows machine. Best ever software to tackle such issue as slow and unresponsive web browsers, system hang, all scrap and worthless files and programs stored on your PC. Not to forget its secure delete feature that overwrites your confidential data with random binary data to wipe the original data for ever. Quick PC Booster is a sure recommendation. Quick PC Booster is a powerful PC speed software for Windows that cleans up, fine-tunes and optimizes Windows PC for better performance. This Xportsoft Technologies owned system tool is specially designed to improve PC speed and tackle all performance-sapping issues, ensuring that you always enjoy a seamless, safe and secure computing. One of the key attractions of Quick PC Booster is its interactive interface which even a novice will feel comfortable using. Apart from the interface, this PC cleaning software also offers excellent help tutorials and 24x7 customer support to help users enjoy a rich Windows experience. Free Download Quick PC Booster and enjoy a fast, secure, and completely optimized Windows computer, performing at its peak. The system utility for Windows features a registry cleaner that lets you boost your PC’s performance by fixing invalid entries, performance-degrading registry conflicts, and several other issues. This way the application ensures that you always get a fast and secure PC. The advanced and secure file deletion feature of this PC cleaning software ensures that the sensitive files and data that you’re deleting from your PC can never be recovered by any data recovery tool. So now, you can safely delete any sensitive files, without fearing that someone will recover them with the help of their traces hidden on your computer. Quick PC Booster offers a Program Uninstaller that lets you uninstall unwanted applications along with their leftovers, ensuring that these programs are completely removed from your hard drive and don’t occupy any disk space. The cleaning and tweaking software features a set of Windows tools that lets you effectively configure, manage and troubleshoot all Windows functions, devices and plug-ins. Using Quick PC Booster, you can also easily manage startup programs to optimize Windows startup time. This will make your Windows booting fast, thereby, improving PC speed. Quick PC Booster is an ultimate system tool that offers you everything you are looking for in an ideal cleaning and optimizing software for Windows: clear-cut interface, plenty of customization options, jaw-dropping features, and above all, advanced and effective tools to clean up PC and keep it fast, optimized and secured. Operating the PC speed software is pretty much easy and quick. You must definitely give it a try once.